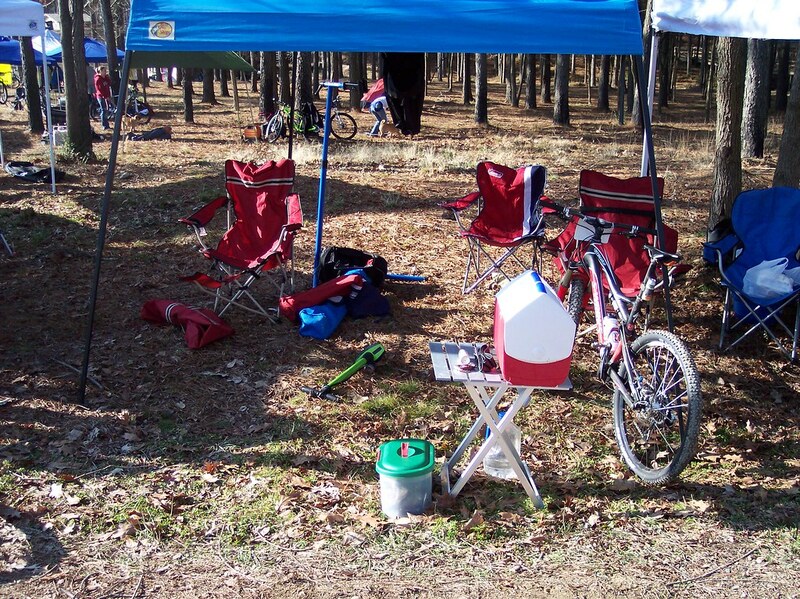 Saturday was the first race of the year for the AMBCS; the Spa City 6 hour mountain bike race at Cedar Glades park in Hot Springs Arkansas. It was also the second event on the USA Cycling US Mountain Bike National Ultra-Endurance Calendar. I didn't have any idea what to expect heading into this race since I'd never ridden the course and didn't know who I'd be competing against, but I'd been training really hard and hoped for a top 10 finish. I made the trip to Hot Springs with Jesse and Brett who were signed up for the 2 man team competition. We arrived at the race site around 6pm Friday evening after an uneventful 5 hour drive from Springfield. We picked up our registration packets, set up Jessie's pop-up camper and headed into town looking for our pre-race dinner. I wanted pasta so we picked the first Italian restaurant that didn't look super expensive and ended up at Rocky's Corner. We all had spaghetti and it was pretty good. I've had good luck when I've eaten huge meals the evening before a race and Rocky's allowed me to test the theory once more. When we got back to the race site the temperature had dropped considerably so we made a campfire and met a few of the other early arrivals. It looked like there were only 5 or 6 other groups camping on site that night. Everyone was really looking forward to the race. When the fire died out we turned in for the night. Unfortunately we couldn't get the heater working in the pop-up, but I still slept pretty well considering the below freezing temperatures. With the sunlight I was able to check out the park a bit more and there were some pretty cool features. There was a bike wash station next to the flush bathrooms, a big tree house like thing with cat-walks, an outdoor climbing wall, a BMX track, an RC track and a small amphitheater. The race started at 10 am with a LeMans style 200 yard run to the bikes. In my last 6 hour race I jogged the start and had a horrible first lap having to stop and go as the riders bunched up on the turns. For this race I sprinted and was among the first riders to the bikes. I had a little trouble clipping in when I got to the bike and that allowed a group of riders to get in front of me but I was still in a good position with only 15-20 riders ahead of me. The race course was approximately 10 miles long and the goal was to do as many laps as possible in 6.5 hours. My first lap went really well. I felt great and was able to pass about 10 riders. For awhile I rode behind the 2009 Leadville overall female winner, Rebecca Rusch. She had an Arkansas rider directly behind her calling out the upcoming terrain; I thought that was pretty cool. On one of the climbs about 7 miles into the lap I felt like I could handle a better pace so I passed them and continued on my own. My time for the lap was 54 minutes. If I could maintain that pace I would be able to do 7 laps. The second lap was my fastest of the day at 53:29. I was feeling really good, enjoying the trail and loving my new bike. The trails at cedar glades park are really nice with lots of switchbacks and many of the turns are banked. The hill climbs are generally short and sweet and there are lots of natural obstacles to keep things fun. There was one really long straight downhill section that was my favorite part of the course. It followed a switchback hill climb and lead to a really fun banked turn switchback section. It was a thrilling ride. On my third lap my legs were beginning to cramp when I pushed it going up the hills and this slowed me down a bit. The perpetum was working really well since I wasn't tired at all and my time for the third lap was 56:50. At the start of the fourth lap I grabbed a banana to help with the cramping and continued to ride as hard as I could. It was really nice that I wasn't experiencing the lower back or shoulder pain I usually experience in the longer races, but the cramping was keeping me from going any faster on the climbs. It was like I was right on the verge of seizing up. I was in pain but it was a manageable pain. I was lucky the hills were as short as they were. I was lapping many riders and could never tell if I was moving up in the overall standings but I was still loving the downhills and doing as well on the climbs as possible. My time for the fourth lap was 59:32. The fifth lap was the worst of the day. My legs were cramping horribly, even on flat ground. Then I realized that it felt like I was riding a BMX bike; my seat had sunk about 4 inches so my legs were never fully extending. I tried to ride standing up as much as possible, but the entire time I was just trying to get back to the pop-up tent so I could grab an allen wrench and raise my seat. Luckily nobody behind me caught up to me that lap and my time was 1:03:39 (includes time taken to adjust my seat). On the sixth lap I felt like a new man. Since I hadn't maintained the 55 minute laps I was shooting for I knew that 7 laps was not possible so I wanted to do as well as possible on my final lap. I still had some minor cramps on the steeper climbs but nothing like the previous lap. I really enjoyed the final lap and I rode it with a time of 1:00:49 for a total ride time of 5:48:19. I was passed on that lap for the first time of the day; it was by the race leader who was lapping me. There were 6 people that were able to do 7 laps and if I hadn't been cramping I think I could have also, but I am happy since I finished 9th overall and 1st in the 30-39 age group. There were 78 male solo riders. After the awards ceremony we packed up our stuff and headed back to Springfield. We stopped at Coltons in Little Rock for a good steak dinner and arrived back in town a little after 1am. The bikes were a bit dirty, but it was a great time and I'm glad I made the trip. I need to figure out a way to prevent the cramps I experienced during the race, but if I keep improving in my training I think I'll have a successful racing season this summer. More Pictures from the parks facebook page. Nice article about the event's pros. Great Job Mark! I was hoping to get 6 laps, but just fell a bit short. I was pretty much done after 5 and didnt have a chance of getting in before the cutoff. Anyway just wanted to say Congrats on a great finish.